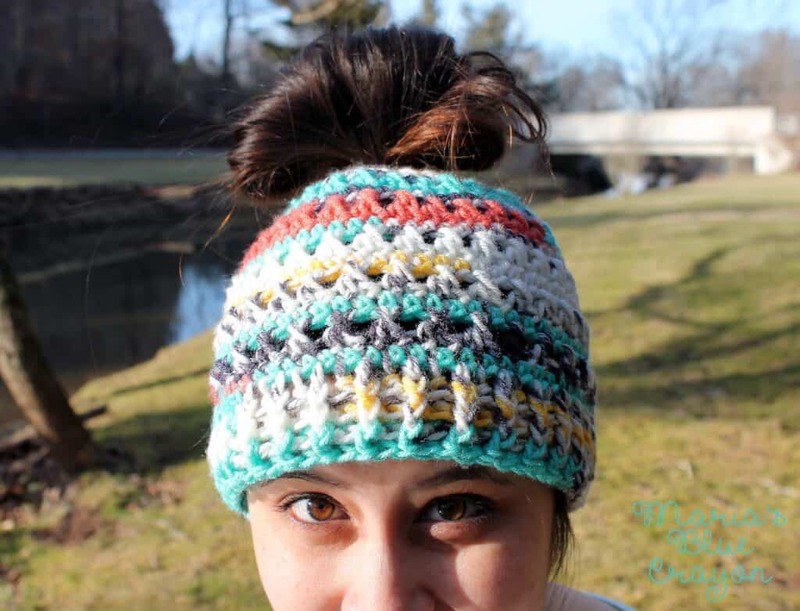 This messy bun hat has been a hot item this Winter! I made a chunky version in the earlier months of Winter, and have decided to make another! (You can check out the quick chunky version here.) This messy bun hat is similar to my former messy bun hat in terms of stitches, but this time around I used a worsted weighed yarn in one of my favorite color ways. Since Spring is quickly approaching, I had to take this pattern off the back burner and share with you all while the air is still crisp! We have been having Spring-like weather here in Central PA, but this hat is not too heavy and because of the stitching, it is very breathable. I find it comes in handy in the brisk morning and evenings. 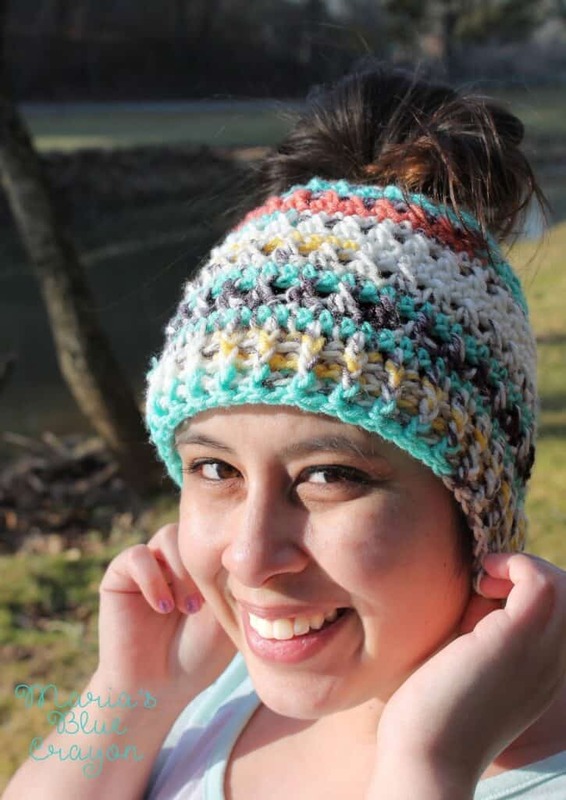 Quick, before this weather gets too warm – pick up your hook and get started on your own messy bun hat! If you have any questions, please don’t hesitate to contact me or leave a comment below! I love your pattern! That yarn is beautiful also! I just need some clarification on the end of the pattern please? Do you mean front post double crochet alternating with back post double crochet? question on row 3 and 5 are those 2 sc in one stitch when it say sc sc increase?? Row 5, how many stitches should I have? I just started this! Do you crochet around the hair tie? Or just join, and have it connected?? I don't have this particular one for a child size – I can put it on my list! hello..this is so pretty. I am wondering, if I opt out of using an elastic band…how many chains would i need instead? For the 3rd row, 2 SC in each means you gave a total of 80 not 60. Not sure how you cane up with only 60. 40 doubled is 80 and that is exactly what I get when following the partern. Please let me know if you need further clarification! Happy Crocheting! Thank you so much. It don't say to skip. I really love this pattern. Also thank you for replying so quickly. When I looked up His hook it said an 8mm. I did it and was way too large. What is the H you use in mm if you know? The is prpobably a silly question, but I would like to ask if the chain one and chain three at the beginning of the rows are counted as a sc or dc for the 40 stitch count. And, when joining at the end of the row, do I join into the chain or actual sc or dc? I love this hat and want to get it right from the beginning! Just made two of these hats for two middle school girls. They are going to love them! Thank you for the awesome pattern!